Small evergreen shrub with aromatic, pinnatisect leaves having numerous obovate, glaucous blue-green lobes. Cymes of small yellow flowers in summer. Very well drained, moderately fertile to poor soil in full sun or part shade. Thrives in hot, dry sites. Foliage plant for borders, rock garden or herb garden. Good ground cover. 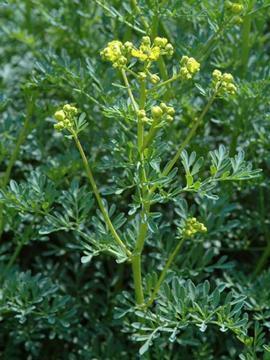 Has been used for flavouring and as a medicinal herb, despite being toxic. Toxic and contact with the foliage may cause severe photodermatitis.